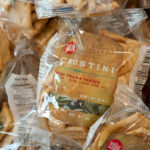 Chef Kiss – you remember him, our friend at the Arlington, Virginia, Whole Foods Market – is always willing to oblige. On this occasion, I asked him to help make a liar outta me. And he sure did. 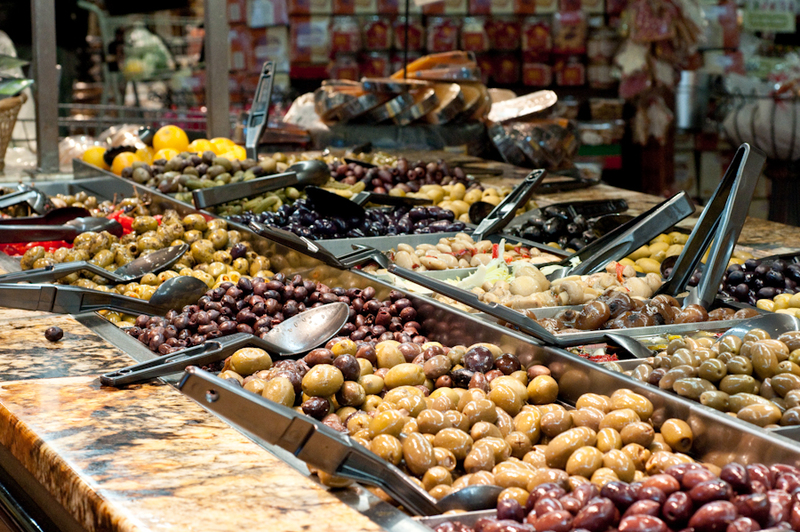 But the thought occurred to me: There’s an amazing variety of olives out there…what if I don’t hate all of them? Surely there could be one or two olive types on this big planet that wouldn’t taste like a Brined Nugget of Doom. So Chef Michael and I put our heads together to talk olives. It’s unfair of me to hate that which I don’t understand. And with that, Michael launched his primer on olives (during which time my hand flew furiously across the notebook as I captured the pearls of wisdom pouring from the chef). “Olives are all pretty generally in the same flavor spectrum,” Kiss noted, indicating that I should expect a briney, salty flavor from all olives. That’s because they are cured to remove the naturally occurring, bitter chemical oleuropin to make them edible. 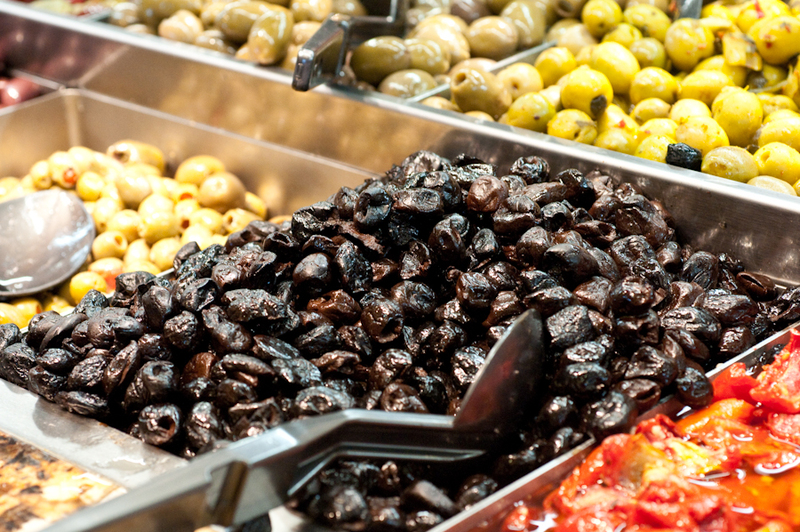 There are generally two kinds of olives, green and black. 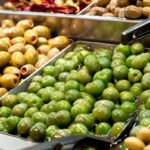 Green olives are less ripe than those mature olives that can come in a range of colors, from black to blush to pink to purple to red. 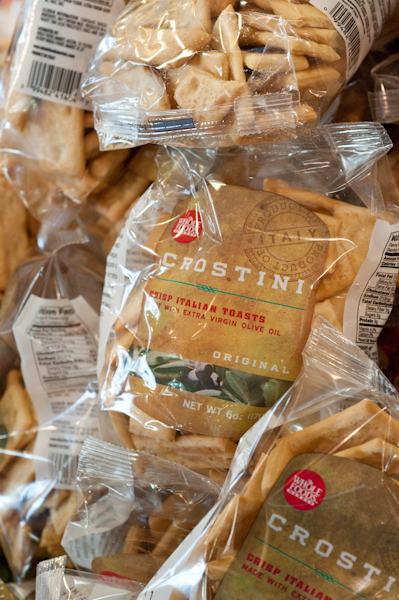 And then you get into distinct varietals from Greece, Sicily, Spain, Morocco, and many other nations. 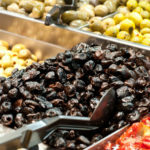 Olives can be enjoyed on their own, in appetizers, added to pizza dough, even added to a savory biscotti recipe, according to Kiss. But the most unusual serving suggestion he shared was to use “olives as palate cleansers between courses during a meal. 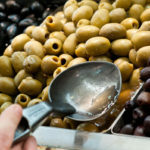 Think of them as ‘punctuation marks,’ and use the salt as an intermediary.” EDITOR’S NOTE: For you readers who are masters of the home culinary arts, please serve olives in this manner and report back! Before we get to the recipes, though, I asked the chef how he cooks with an ingredient that he hates to eat. In my kitchen, if I don’t want to taste it, I don’t eat it, but a professional chef doesn’t have that option. OK, if I was still unsure at this point about whether I would be so bold as to taste test a few olives, this latest snippet of conversation guilted me into it. Clear olive water means it’s clean. There shouldn’t be any floating “funk,” which could mean that bacteria are present. 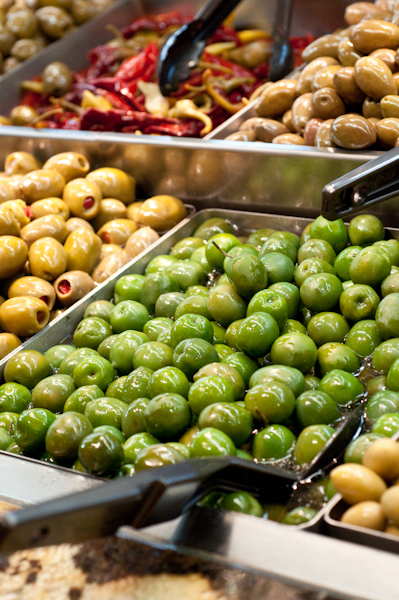 Since olives will be kept cold, oil could congeal, but congealed oil will look distinctly different from bacteria floating in water. Purchase from a shop that is busy, from a bar that is well kept and constantly restocked so that it is full. When you visit over time, the products should be placed consistently. You should usually be able to find the same olive variety in the same bin every time. 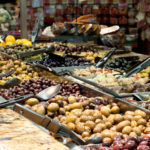 A good gourmet shop or high-end grocery store won’t object to shoppers tasting with discretion and manners. Obviously, don’t make a meal of it, and NEVER put fingers in the bin or on serving utensils. 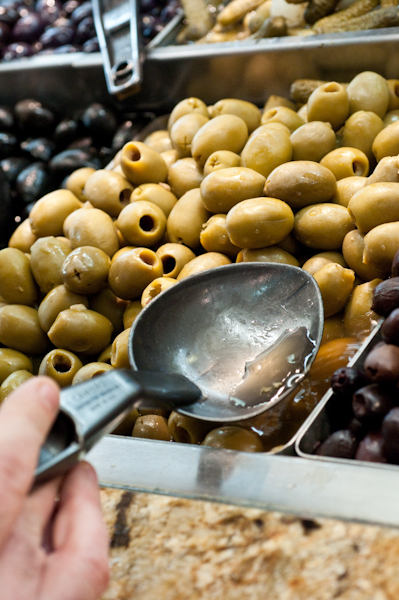 Scoop one olive out of the bin, into a container, and then use your fingers to taste it. 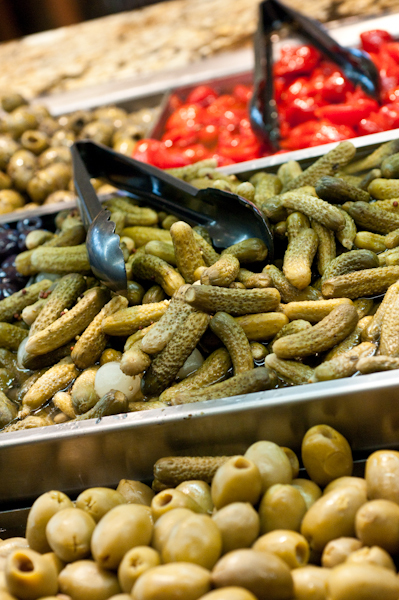 Approach stuffed olives with caution – they may still contain pits. Don’t mix olives in one container unless you want them all to take on the same flavor. Flavors will meld if they’re stored together. 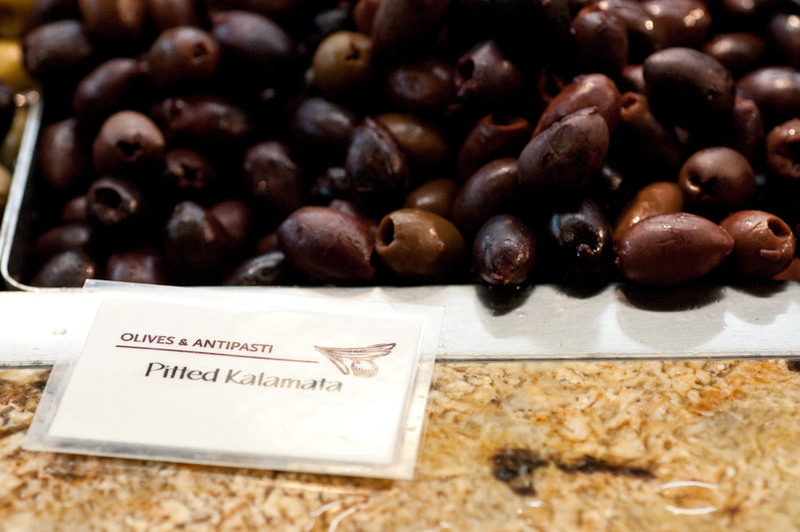 For people – like me and Sam – who don’t like olives, find one you do like and taste others with similar appearance/texture. 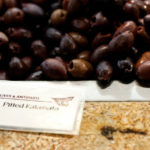 Once you purchase the olives, they will keep (out of the brine) in the refrigerator for about seven to 10 days. 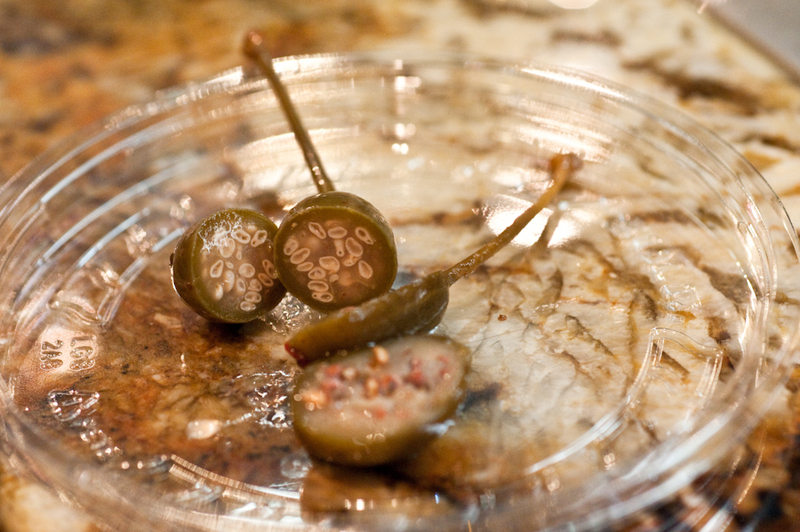 If you’re storing olives in brine, they can stay fresh much longer. And then we came to the moment of truth: my first olive tasting in a long time. I tried a green olive, and well, ew. Those were ruled out pretty quickly. But then Michael had me try a small, black, oil-cured Moroccan olive with a leathery texture and…I didn’t hate it. I didn’t love it, but I’m considering purchasing some to serve as appetizers or perhaps in a tapenade. We tasted a few non-olive items offered at the bar, including a sweet and hot red peppadew from South Africa, which was kind of like a brined hot pepper; a caperberry, which had a curious texture punctuated by crunchy seeds found inside, and a flavor not unlike a green olive; and a pepper shooter, a not-too-hot cherry pepper stuffed with provolone cheese and Prosciutto. The hot items possessed a flavorful heat, not too spicy, even for this taste-tester, who isn’t very adventurous when it comes to hot and spicy foods. The chef had a slew of recipe ideas, just off of the top of his head, including a savory olive biscotti, olive pizza dough, Catalan olives stuffed with bleu cheese as an accent to a martini, olive pesto, olive spaghetti sauce, diced olives mixed in ground beef for hamburgers, and so much more. Here I’ll share two recipes sure to delight guests at a party this holiday season: olive tapenade and olive cream cheese spread. 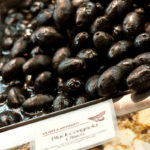 According to Chef Kiss, a typical olive tapenade is made with about 50 percent olives, but this can be adjusted according to taste. 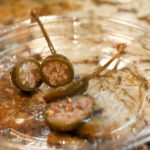 Take 1 cup olives (any variety or mix will do) and grind them in the food processor with raw or roasted garlic and capers. Grind, but don’t puree. You want to keep a good texture. Add olive oil and a splash of red wine vinegar and/or lemon juice and/or orange juice to taste. This tapenade will last about a week in the refrigerator, so it’s a great make-ahead appetizer. 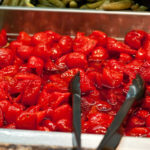 You can add tomatoes, cucumbers or other veggies, but those ingredients will shorten the shelf life. Make sure you taste the tapenade before serving as flavors will change as it sits in the fridge. 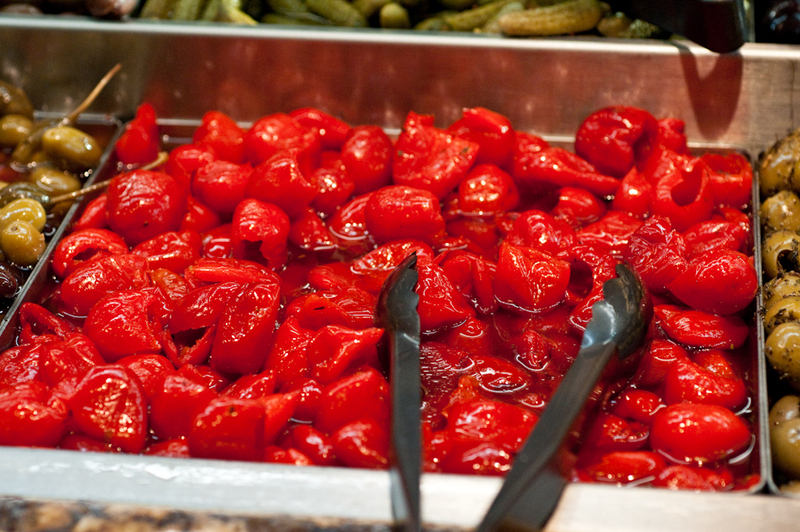 You can also use this mixture as a sandwich spread or add it to spaghetti sauce. Chef Michael’s recipe for olive cream cheese spread is incredibly simple. Dice olives, mix them with cream cheese (I usually use Neufchatel instead) and add horseradish and mustard to taste. You can serve that as a simple whipped dip or shape the cream cheese mixture into balls and roll the balls in chopped nuts for an elegant “party ball” presentation. And there you have it, folks. I went to Whole Foods, I visited with Chef Kiss, I tried olives, and not only was I was proved wrong, I was pleasantly surprised along the way. Are there foods that you just can’t stand, but you try them anyway in the hope that maybe your palate will change? 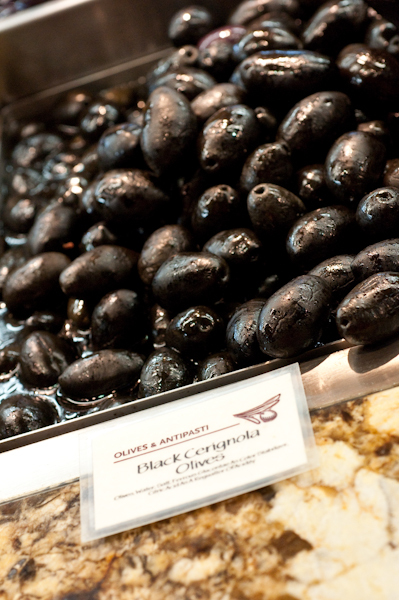 How do you feel about olives? How do you serve them in your home? I had almost this exact experience. 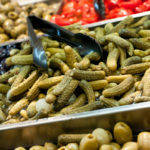 I thought I hated olives but I tried some from an olive bar – they were huge and stuffed with goat cheese and absolutely delicious. I keep olives in my fridge now, and sometimes just one olive will give me such a flavor hit, it stops me from aimless munching.